Hi girls some of you have been asking how to use the corner and border punches together to make a square. 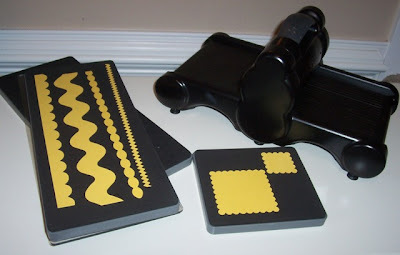 I am sending you this YouTube video to show you how (the video is from Stampin UP but I am not sure how to get it directly on here so if you click on it I am hoping it will take you to it if not please cut and paste the address in your browser to view it). Enjoy- great tips. Stamp Club Surprise for me!!! I have the greatest stamp clubs! 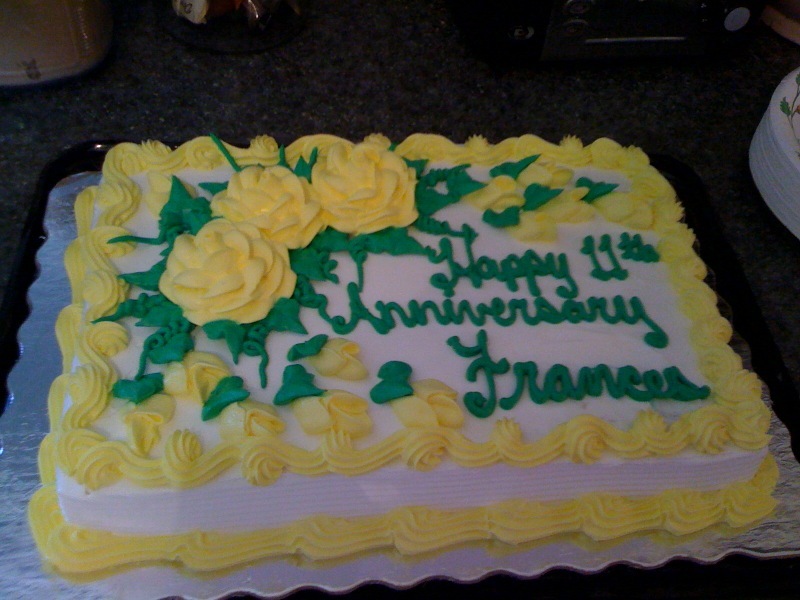 Yesterday when my Magnificent 8 girls came, Brenda was our hostess and she brought this gorgeous and delicious anniversary cake for my 11th Stampin'UP! Anniversary. Gloria brought me a bouquet of roses from her rose garden. I am so blessed to have these friends. 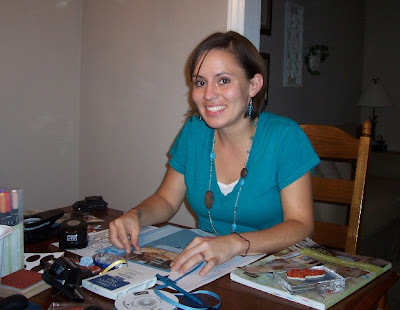 I would not have ever met any of them if it were not for my Stampin UP Business. The friends I get are the very best fringe benefit. :) Thanks girls. I can't believe I have been sharing my Stampin UP Business for 11 years on August 31st. To celebrate, I will give you a 11% off any order over $50 (before shipping and tax) on Tuesday, August 31st. all day till 8pm. You will have to order through me NOT on line to get your discount. 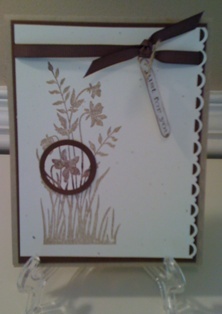 If I have enough orders to make a $150.00 workshop I will draw names from the participants and share the hostess gifts. Be sure to let me know if you want to get your name in the hostess drawing by placing your $50 or more order. I will make all those that participate a new fall card using new sets from the Holiday Mini Catalog. Thanks for stopping by. YIPPPPY!!! I GOT MY FREE $150 ORDER TODAY! 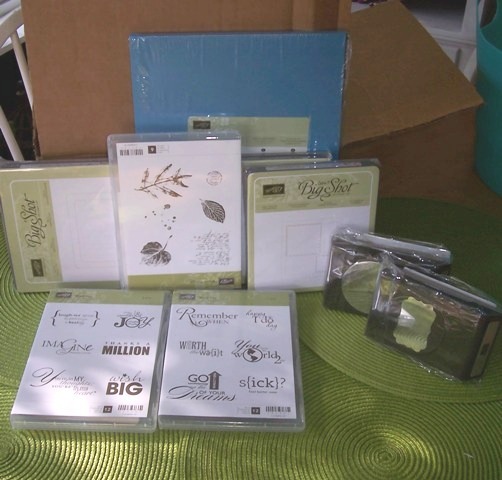 I am so excited to earn the title of Manager and for that Stampin UP gave me a $150 shopping spree! Did I say I love Stampin UP! Here are my goodies and I wanted to share my moment with you. :) Here is the new Tasteful Trim Bigz die from the Holiday Mini. I can't wait to use it. 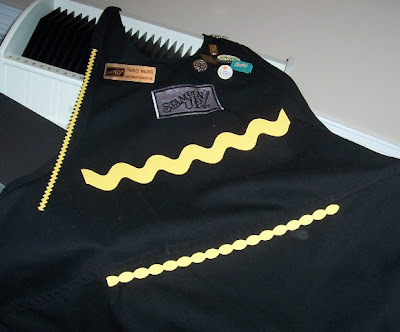 I decided to lay the die cuts (card stock) accross my Stampin UP apron to see what it could do for my apron. Can I say I love it. I know that we can cut up to 8 layers of fabric with this die and I will fold it right before the cutting line so it will be continues and I will first iron on the fabric adhesive so all I have to do it iron it on my apron. I will show you when I finish that project. I have always loved rick rack and I can see so many possiblities with this. Add it to a baby t-shirt or a kitchen towel for gifts. Please check back to see what I come up with. Thanks for looking. One of my newest customer Melodie Love-Wagner and I are working on scrapooking. 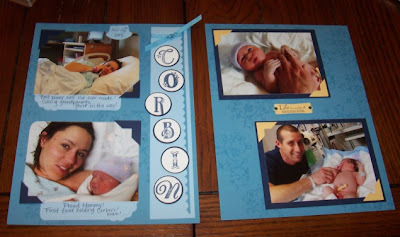 She is working on her almost 2 year old Corbin's book and I need to work on my 30 and 36 year baby book. Ok so I am really behind but Melodie has inspired me. :) This was her first two pages below from the hospital. I love the way it turned out. Let me know if you want to join us and catch up on scrapping your cherished memories. Thanks for looking. Stop by again soon. I love the spotlight technique to show off part of the stamped image. The state of North Carolina is having a sales tax holiday this coming weekend for school supplies up to $100.00 per item August 6 - 8. Because school supply items are included in this sales tax holiday, the below list of items will be tax free during the holiday period. Please note that you must place your order with me during the tax holiday period in order to receive these items tax free. This is a limited-time benefit! And here's a one-time tax-free offer from me: Purchase the Big Shot Die-Cutting Machine #113439 and I will pay the tax! Offer good only during the North Carolina sales tax holiday and only for NC residents. Pink Baby Card supplies Baby Tees wheel, Teeny Tiny Wishes, Word Window Punch,Curley Label Punch, Itty Bitty Shapes Flower Punch, Large Oval Punch, Scallop Oval Punch, Scallop Edge Border Punch, string, brads, Pretty In Pink cardstock and ink, Whisper White Cardstock and sponge. Thanks to Jackie Topa for her beautiful card that was my inspiration. I am turning over a new leaf, using stamp sets I have bought (imagine that). As I looked at my retired things and saw that I had not used all of them, (I know that my friends, family and customers can not see what wonderful products they are in my closet). I started using sets that I had not mounted yet. I got this idea from a blog and for the life of me I can not find it or who made it so if it was you please email me and I will give you credit for your great ideas. I changed a few things but not much. Artistic Etchings: Crum Cake, Cherry Cobbler, Early Expresso ink and card stock plus Very Vanilla, Large Oval Punch, Scallop Oval Punch, Round Tab Punch, 1/2 circle punch and 5/16 Neutrals Chocolate Chip Brad. Thanks for looking!